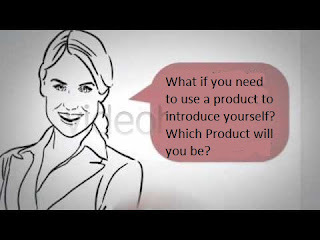 .....My Views Encapsulated In Words...: What if you need to use a product to introduce yourself? What if you need to use a product to introduce yourself? Recently, I was interviewed by a firm where they asked me to choose a product to introduce myself. Weird as it sounds, it was actually more interesting to perform. For my better understanding and to keep it simple, I chose Eyeliner. As we all know that Eyeliners are known for Striking color, Giving Bold Look, Long Lasting appearance and it has Brush as a tool to apply. Similarly, I tried to portray my persona with the qualities this product has. "When we talk about its Striking black color, it gives your eyes a look of attention demanding, the color black signifies the power, strength and elegance with itself and so am I as an individual. Whatever in my life I have achieved or ups and down I came across I always had that inner strength which helped me to succeed and grow stronger. As an example I can relate when I was interning in Singapore with a firm, they offered me a full time role but it took about 5 months visa to process due to internal issues within the organization. Rather than crying or thinking about its repercussion’s I did freelance work to gain experience and understand more about Marketing. This not only gave me strength but also bold nature to face adversities and happiness with both hands just like Eyeliner which gives bold look. To add Eyeliner main quality is that it gives a long lasting and long wearing look which helps you to look same and always on your mark all the time. I can relate this quality of Eyeliner with dependability as any organization or group or family I have worked with they always used to believe in me that the work assigned will be done on time no matter how hard it will be, there will be a possible solution which I will find our either by myself or consulting others. To quote an instance once with my former organization Accenture – my Boss had to go on sudden leave of 1 month and we had a deliverable to be presented to client. I had little idea of what needs to be done, rather than panicking in this situation, I learnt the process which needs to be done and with the help of seniors successfully delivered the expected outcome of the project. Last but not the least the brush is the tool of eyeliner without which its other qualities will not be able to reach out to masses and that tool which helps all my qualities to reach out to you is research ability and confidence. I believe whatever is presented in view of others needs to be well researched and to be present with sheer confidence to leave impact. This is my tool which I always carry with me with smile."